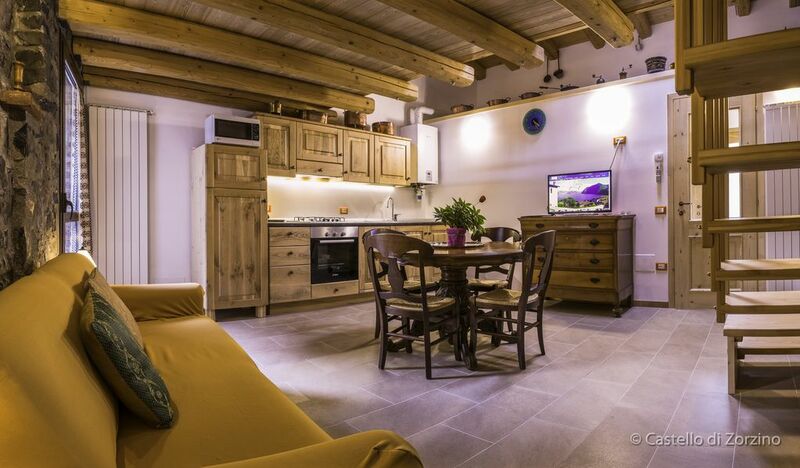 Apartment that was originally a barn, just renovated with particular attention to the use of paints and natural materials, enhancing the wood and the exposed stone walls. Furniture chosen to recreate a warm and ancient environment. Always bright, during the day, thanks also to the obscure skylight on the roof and in the evening to the powerful LED lighting. In the apartment there is a washing machine, dishwasher, fridge with freezer, microwave, oven, Smart satellite TV and WiFi connection, passing the street, you can also access the garden of the castle equipped with tables and chairs, deck chairs and two barbecues . The apartment has independent access, the garden accessed by passing on the road, is shared with other possible guests of the castle. Zorzino is a small quiet village, a few steps away there is a shop, further on, towards the church there is a playground while climbing a few meters towards the mountain you are walking in the paths in the woods. At 1 Km, reachable on foot from the road or from the steep forest path, there is Riva di Solto, a small picturesque village with fantastic walks along the lake. This area is not particularly well served by public transport, for small trips within the country it is advisable to move on foot while it is always advisable to have a car. Car parking is not direct at the apartment and no direct garden access. But a beautiful place and great management. Thank-you for a wonderful vacation.